I’m a huge fan of beauty guru Janice Cox. She’s written several books over the years with cool recipes to try at home. Even better, lots of her hair recipes are fun, easy to create and really work. 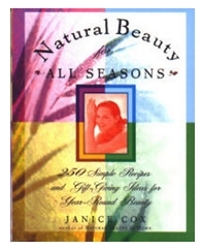 The first book I bought from Ms. Cox was Natural Beauty for All Seasons – 250 Simple Recipes and Gift-Giving Ideas for Year-Round Beauty published by Henry Holt and Company New York 1996. I became addicted. 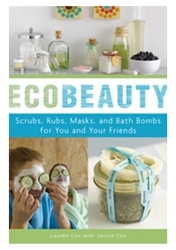 Her most recent book is EcoBeauty. One of my favorite recipes in this latest book is Minty Hair Rinse which helps naturally blow up the volume in your hair with mint tea bags. It’s easy to make and it really works. I must confess that like all home hair recipes I play with them until they work for my own hair. The ingredients and instructions for making the Minty Hair Rinse are courtesy of Ms. Cox, but the detailed use instructions are mine. Bring water to a boil in the microwave or on the stove. Steep tea in boiling water for 2-4 minutes. Remove the tea bags and allow to cool. Mix with vingear and pour into a clean resealable bottle. Clean pre-treated and/or detangle hair in lukewarm water. If you prefer use your favorite alternative cleansing method such as Diluted Shampoo (DS), Conditioner Only Wash (CO Wash) or Water Only (WO). If you wish, use a volume enhancing cleansing formula to get lots of fullness. Completely rinse cleanser or shampoo formula from hair. Squeeze excess water from hair like an accordion. Apply a volume enhancing rinse-out conditioner to hair from the top of the ears down to the ends. Avoid the roots since too much conditioner flattens them. If your hair is extremely fine or thin you may want to use just a tiny bit of rinse out conditioner to help with the detangling process. Detangle with fingers and/or wide-tooth comb. Work on individual horizontal sections of the hair until completely detangled. After hair is completely detangle rinse conditioner completely from hair. Finish with a cool or cold water rinse. Towel blot to remove excess drippage. Detangle with a wide tooth comb or your fingers. Pour the mint rinse onto your still damp hair starting at the scalp. Use fingers to pat (don’t rub or massage with fingertips) minty rinse into hair. Have a clean plastic bowl available to catch tea rinse drippings. As the mix drips down your hair catch it in the bowl and continue to pour over your scalp until all of the rinse is used up. Do not rinse the minty rinse from hair. This is a leave-in treatment. Style hair as usual. 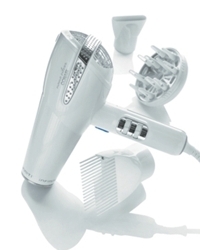 Blow dry with a round boar-bristle brush and a concentrator attachment to direct air flow from the ends up to the roots. Or you may wish to blow dry bent over at the waist. 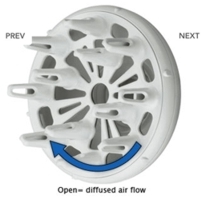 Another option is to set hair on large foam rollers and either air dry or sit under a hood style dryer. If you have long, very long or thick hair, you may want to double the recipe (4 mint tea bags to 1 cup or boiling water). Or you experiment with different variations. I actually like to use 1 teabag per 1 cup of boiling water as my own personal preference. Also, I like to experiment with a wide range of mint teas, both loose and bags. This recipe offers so many options including laying on root lift products such as Phyto Volume Actif or similar. Enjoy! If you love this recipe, be sure to check out all of the great DIY at-home beauty books from Janice Cox and have fun with your hair. This entry was posted on Thursday, October 13th, 2011 at 11:52 pm	and is filed under Hair. You can follow any responses to this entry through the RSS 2.0 feed. Both comments and pings are currently closed.